מרצדס S63 AMG - מקבלת מנוע 5.5 ליטר V8 ביטורבו. 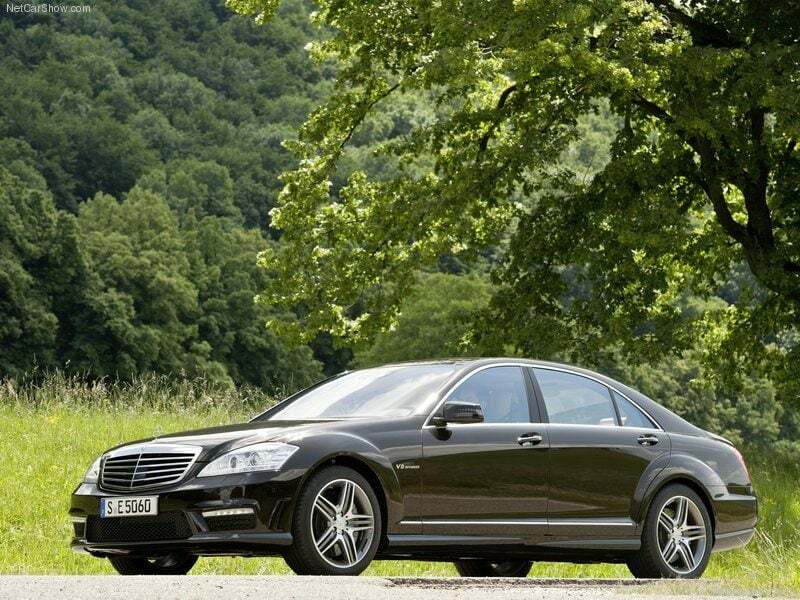 S 63 AMG, is to benefit from a completely newly developed powertrain. The AMG 5.5-litre V8 biturbo engine with a peak output of up to 420 kW (571 hp) and a torque of up to 900 Nm, in combination with the unique AMG SPEEDSHIFT MCT 7-speed sports transmission, contributes towards a considerable reduction in consumption and emissions, while at the same time increasing maximum power and torque. With a fuel consumption of 10.5 litres per 100 kilometres (NEDC combined), the new high-performance Saloon not only undercuts its direct competitors – it is also more than 25 percent more economical in terms of its fuel consumption than the previous model with naturally aspirated V8 engine. The new S 63 AMG marks the start of a new chapter in the "AMG Performance 2015" drive strategy: Mercedes-AMG is continuing this impressive story and is meeting its promise to continuously reduce both the fuel consumption and emissions of new models with the new engine/transmission combination – while reaching new heights with the central AMG brand value of "performance". According to Ola Källenius, head of Mercedes-AMG GmbH: "We are heading into a new era with the S 63 AMG: for the first time we have combined spray-guided direct petrol injection with biturbocharging and the start/stop system. Together with the AMG SPEEDSHIFT MCT 7-speed sports transmission, we have reduced both fuel consumption and emissions significantly – while at the same time increasing output and torque." The new AMG 5.5-litre V8 biturbo engine will play a significant role in the Mercedes-AMG model strategy over the coming year. The unique AMG SPEEDSHIFT MCT 7-speed sports transmission will also help to ensure that future high-performance AMG vehicles benefit from an exciting and at the same economical transmission of power too. The new engine/transmission combination marks a further milestone in the successful history of Mercedes-AMG, which began back in 1967.
efficiency and features a whole host of impressive technological highlights: for the first time AMG is taking advantage of direct petrol injection with spray-guided combustion and piezo injectors. This technology enables improved fuel economy thanks to higher thermodynamic efficiency, which in turns leads to lower exhaust emissions. AMG has combined the spray-guided combustion with biturbocharging. Other highlights of the innovative, original eight-cylinder engine from Affalterbach include full aluminium crankcase, four-valve technology with variable intake valve timing, air/water charge air cooling, generator management and also standard Controlled Efficiency start/stop function. Compared with the AMG 6.3-litre naturally aspirated V8 engine with a displacement of 6208 cc, the new AMG 5.5-litre V8 biturbo engine achieves all this with a displacement of 5461 cc. This high-tech package leads to a high output and torque yield, together with fuel consumption figures that are unrivalled in the competitive lineup. The AMG 5.5-litre V8 biturbo engine develops a peak output of 400 kW (544 hp) and maximum torque of 800 Nm. In conjunction with the AMG Performance package these figures are increased to 420 kW (571 hp) and 900 Nm. A look at the performance diagrams shows that no other engine in this output class achieves the figures delivered by the new AMG biturbo. The major difference between the two performance classes is an increase in the maximum charge pressure from 1.0 to 1.3 bar. In addition, the engine cover of the S 63 AMG with the AMG Performance package comes in genuine carbon fibre. With an NEDC fuel consumption of only 10.5 litres per 100 kilometres, the new S 63 AMG is 3.9 litres more economical than the previous model powered by the naturally aspirated AMG 6.3-litre V8 – despite an increase in output of 14 kW (19 hp) and 34 kW (46 hp) respectively, and in torque of 170 and 270 Nm. Engine specialists consider this achieved fuel saving of more than 25 percent to be nothing less than a quantum leap. CO2 emissions have likewise been significantly reduced: at 244 grams per kilometre, the figure is almost 30 percent lower than for the previous model. Both performance variants have identical fuel consumption and CO2 figures. With figures like these, the new S 63 AMG is not only considerably better than all its competitors, but also more fuel-efficient than much less powerful cars in this segment. At the same time the S 63 AMG delivers superior performance at sports car level: the high-performance saloon accelerates from zero to 100 km/h in 4.5 seconds, and has an electronically limited top speed of 250 km/h. The 100 km/h mark is reached in just 4.4 seconds with the AMG Performance package, with the top speed increased to an electronically limited 300 km/h. It is not only the unrivalled torque delivery of this turbocharged eight-cylinder that makes the heart beat faster, as the agile responsiveness with no irritating charger delay leads to an effortlessness and dynamism previously unknown in this output class. All perfectly matched by the powerful, sonorous engine note. Moreover, this AMG high-performance engine naturally meets all the requirements with respect to smooth, quiet running and the comfort on long journeys that is to be expected of a Mercedes. Power is transferred by the AMG SPEEDSHIFT MCT 7-speed sports transmission used exclusively by AMG, which is already familiar from the SL 63 AMG and E 63 AMG and combines high emotional appeal with outstanding driving dynamics, impressive comfort and a high level of efficiency. The wet start-up clutch replaces a conventional torque converter, and helps to save fuel. The exemplary fuel economy is also in large measure due to the standard start/stop function. This system is active in the transmission's Controlled Efficiency ("C") mode, and switches the eight-cylinder engine off when the car comes to a stop. In "C" mode the sports saloon always starts off in second gear, and the transmission shifts to the next, higher gears at a decidedly early stage. With its high torque at low engine speeds, the V8 engine encourages a smooth, effortless driving style. The eight-cylinder biturbo engine also features the generator management system familiar from the E 63 AMG: whenever the engine is on the overrun or when braking, kinetic energy is used to charge the battery rather than being wasted as heat in the usual way. In all other operating modes a combination of onboard network and generator management enables the generator to be kept at a low voltage. This reduces the load on the engine and makes for fuel savings of around 0.15 litres per 100 kilometres according to the NEDC standard, and up to 0.2 l/100 km in city traffic with its frequent overrun and braking phases. Powerful eight-cylinder engines are an inseparable part of AMG's corporate history. Established in 1967, the company immediately caused a stir with the 300 SEL 6.8 AMG which succeeded in taking second place at the 24-hour races at Spa-Francorchamps (Belgium). The AMG racing saloon was technically based on the Mercedes-Benz 300 SEL 6.3. With an engine output of 184 kW (250 hp) at 4000 rpm and a top speed of 220 km/h, this luxury V8 saloon was Germany's fastest regular production car at the time. Classic tuning as well as an enlarged displacement from 6330 to 6835 cc resulted in an increase in output to 315 kW (428 hp) at 5500 rpm and in torque from 500 to 608 Nm. A further milestone in the AMG engine story was the M117, the first eight-cylinder unit with four-valve technology. With a displacement of 5.6 litres, 265 kW (360 hp) and 510 Nm of torque, this V8 accelerated the Mercedes-Benz 300 CE 5.6 AMG to a top speed of 303 km/h in 1987. This made the coupé the fastest German car in series production, and American fans reverently christened it "The Hammer". Another important engine in the history of AMG was the supercharged AMG 5.5-litre V8 introduced in 2001: the M113 K developed an output of up to 428 kW (582 hp) and torque of 800 Nm. The supercharged AMG 5.5-litre V8 in the SLR McLaren of 2003 was even more powerful – the M155 developed up to 478 kW (650 hp) and 820 Nm. 2005 saw the debut of the AMG 6.3-litre V8 engine; depending on the model, the naturally aspirated, high-revving M156 developed up to 386 kW (525 hp) and 630 Nm. Exclusively reserved for the new SLS AMG, the likewise 6.3-litre M159 has a maximum output of 420 kW (571 hp) and maximum torque of 650 Nm. Numerous victories in the "International Engine of the Year Awards"
The supercharged AMG 5.5-litre V8, the AMG 6.3-litre V8 and the AMG 6.0-litre V12 biturbo were all able to win the Best Performance Engine category in the International Engine of the Year Awards. The AMG 6.3-litre V8 also won in 2009 and 2010 in the "Above 4 litres" class. In visual terms, the new S 63 AMG is distinguished by a number of subtle touches: "V8 Biturbo" lettering on the mudguards points to the new powertrain. Also new are the AMG triple-spoke light-alloy wheels, painted in titanium grey and with a high-sheen finish, and fitted with 255/40 or 275/40 R 19 tyres. In the interior, the S 63 AMG boasts a newly designed AMG instrument cluster with "AMG V8 Biturbo" starting screen. The standard PASSION leather upholstery has been enhanced with new, contrasting colour stitching. A new range of attractive optional appointments is now also available for the S 63 AMG: the Bang & Olufsen BeoSound AMG high-end sound system, developed especially for the S-Class, ensures an exceptional listening experience. With a total output of 1200 watts, 15 loudspeakers, acoustic lens tweeters in the A and B-pillars as well as a digital sound processor (DSP), it transforms the Saloon into a full-blown concert hall with perfect acoustics. The unique combination of innovative camera and radar-based driver assistance systems has been enhanced even further with immediate effect with a view to perfecting the vehicle's active and passive safety. The new Active Lane Keeping Assist comes into play when the S 63 AMG unintentionally strays over a solid line on the right or left of a lane or on the outside of a bend. In such cases the Electronic Stability Program ESP® applies the brakes to the wheels on the opposite side of the vehicle to prevent it from unintentionally straying from its lane. The AMG sports suspension based on Active Body Control (ABC) provides crosswind stabilisation as standard equipment: thanks to this function, influences caused by crosswinds are compensated for, or – in the case of strong gusts – reduced to a minimum. ABC compensates against the effect of crosswinds by adjusting the wheel load distribution within milliseconds, using the yaw-rate and lateral acceleration sensors of the ESP®. Also making up the standard equipment is the Torque Vectoring Brake: when cornering, brief direct application of the brakes has an effect on the vehicle's inner rear wheel so that the saloon corners precisely and under control at all times. The Torque Vectoring Brake is an additional feature of the Electronic Stability Program and not only noticeably improves responsiveness but also active handling safety in critical conditions. The driving experience is further heightened thanks to the Direct-Steer system: with its variable ratio depending on steering angle, it helps to ensure a more direct response when cornering, and therefore more responsive handling – in brief: enhanced driving pleasure at the wheel of the Mercedes-AMG S-Class. Based on the ADAPTIVE BRAKE system, the AMG high-performance braking system continues to provide optimum fade resistance, deceleration and sensitivity. The front axle features a double floating brake caliper. This exclusive technology combines the advantages of a sliding-caliper disc brake – reduced heat transfer to the brake fluid and clear advantages in terms of comfort thanks to the brake lining guide mechanism – with the efficiency of an extra large fixed caliper brake. The AMG Performance package costs 7900 euros (excl. VAT) / 9401 euros (incl. 19% VAT). Exclusivity and dynamism, effortless superiority and high tech: both the S 63 AMG and the top-of-the-line V12 model, the S 65 AMG, embody all of these characteristics. Since their market launch some four years ago, the S-Class models from AMG have won the hearts of more than 10,000 customers around the world – turning them into the clear market leaders in the small yet highly exclusive high-performance luxury saloon segment. The twelve-cylinder S 65 AMG model now produces 463 kW (630 hp) and will also be celebrating its market launch in September. The vehicle has a sales price of 192,500 euros (excl. VAT) / 229,075 euros (incl. 19% VAT).